Further, the developers can compose components using HTML component, connected to typeScript code for imperative program. The update was actually focused on making Angular framework even further smaller, faster and simple to implement. 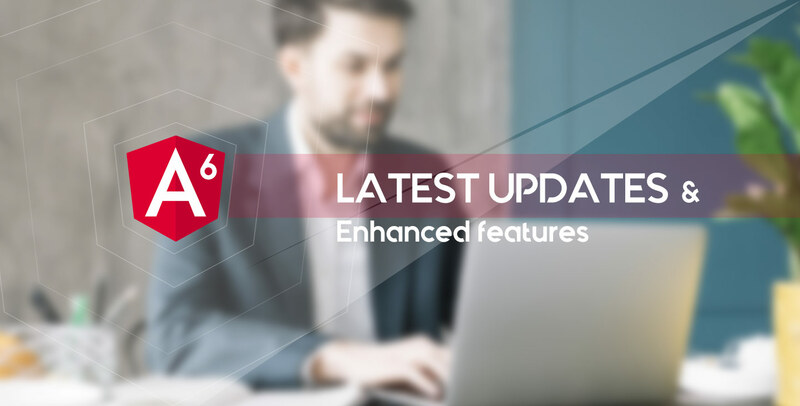 In this blog explore some of the latest features in Angular 6 and how it will benefit developers in their development. In the development involves single-page application development, Angular is considered an ideal option. Earlier, creating a widget to add to the existing web page was not easier. The Angular Element package allows to convert a component into a custom element provides an easy path for developing HTML content dynamically for a new Angular app. Further, Angular Element package allows creating native custom elements for your new Angular app. It focuses to take advantage of web components supported by modern web browsers. which provides more than 30+ UI components. For Responsive Web design Layout, it offers constant support, covering the entire kit. Therefore no need to learn CSS grid or use other libraries like FlexLayout. @angular/cdk/overlay package is the another most talked improvement, having all the new logical positing to make pop-ups stay on screen in a useful way. With NavigationStart, there is no option if navigation is triggered imperatively or via changing location. The use cases are handled with a unique approach for the use cases (for instance, scroll position restoration). Further, PR provides a navigation source field and restored navigation id. This makes it's crucial to add navigationSource and restoredState to NavigationStart. Using the technology called Schematics, Angular CLI generates Angular artifacts, useful for developers to create templates. Staring from Angular CLI 1.7, there are new commands equipped like ng-adds and ng update. the former allows to add features fast in the application and the other automatically updates project dependencies, making automated version fixes. The new CLI also helps developers in creating code transformations like ng update for transpiling various libraries via Bazel tool. Ivy was built with the aim to improve speed, reduce the size, and increase flexibility, resizing the app to smaller to make the fast compilation. Further, switching to Ivy rendered is expected to be smooth with the new updates. And this feature enabled reducing the code size with gzipped the code to make compilation faster. Service Worker - a script, runs in the web browser to manages the cache for an application. Although it was available in angular 5 also, angular 6 service worker has improvised with additional feature and bug fixing. The new version of RxJs(version 6.0.0) is available with additional new updates and unique features. this innovative update allows enhancing performance. Further, it makes easier to debug call stacks and improve modularity. In order to make your app smaller, the modules referencing services has been shifted to services referencing modules. This allows developers to inject code base in modules i.e bundle services only. The beta version of Angular 6 showcases a good reason for the developers to get excited. With the new build optimizer, now the developers will find it easy to create application smaller, improving compiler to makes things go faster. Thus, the overall experience will become extremely easy and intuitive. No doubt, the Angular 6 successfully fulfills the limitations of Angular 5, therefore you must view all the updated and new loaded features in Angular 6. And, if you are looking to hire web developers or web development company who possess good knowledge in Angular development. Get to know at Root Info Solutions, how the Angular developers are exploring the Angular 6 to implement faster, smaller and easy to use interface which for the improved web development to great extent. We are already engaged in testing the new features in Angular 6 to make development better than previous updates.